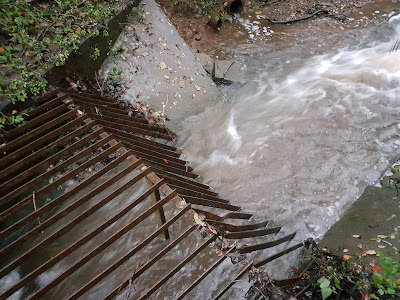 Where these channels end, the water enters old streams and they simply can't cope with the increased volumes of water often resulting in large erosion issues. This is one of the reasons why we have put so much effort into protecting stream banks with our wooden bundles made from harvested willow from the LNR. These fill up with silt and work brilliantly. These bundles were done several years ago and saved a huge erosion point from getting worse. 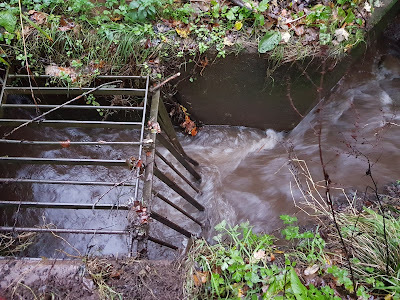 A big problem starts to happen with massive downpours, which is compounded by the heavy winds breaking off lager branches all accelerating natural autumnal leaf fall. Larger branches and twigs get washed and trapped against the metal grills of man made culverts, which make a kind of nest which gets lined with all the leaves, which cloggs up the flow of water. When this happens, the water levels back up , rise and even greater erosion and flooding occurs. Luckily, there is a department within Torfaen Council who have responsibility for drainage. 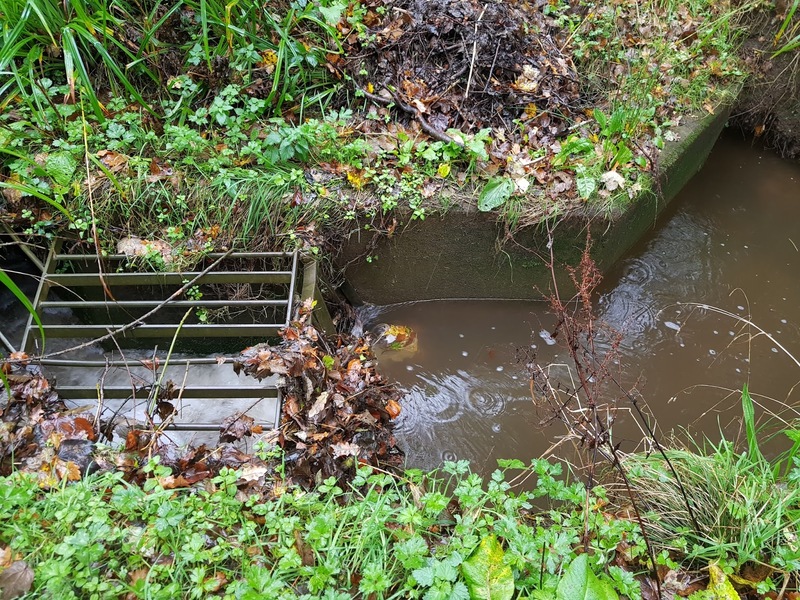 However, it isn't just culverts they look after, it is also all the drains on all the roads in the county. 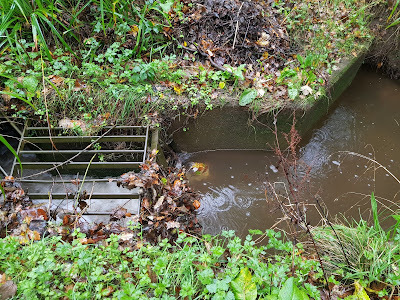 It doesn't take too many autumnal leaves to block these drains, resulting in localised flooding. 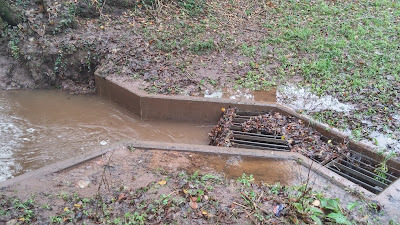 It is impossible for these teams to be everywhere all of the time and in fact a dog walker told me this evening that they were out cleaning the culverts on the LNR only last week. 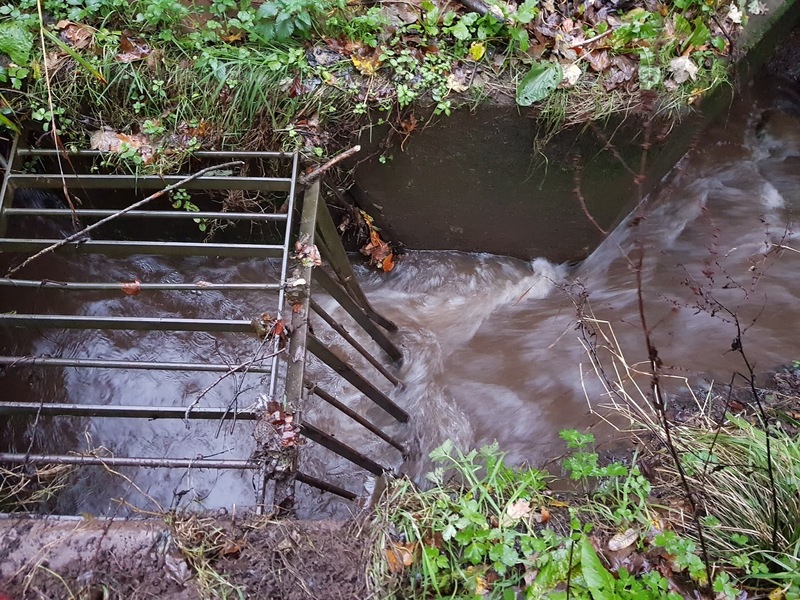 To help out and from time to time, we get out our muck rakes as volunteers and help to clear out the culverts which pass through Henllys LNR. Today was one of those days, in the pouring rain. At the minute, the whole LNR is saturated and the ponds are full. There is surface water everywhere and the streams are all raging. 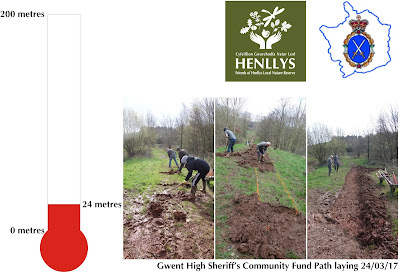 The desire lines are all marshy (apart from on our Gwent High Sheriff's Community Fund path) and the water is just finding its own way down to the lowest point. I came across this really interesting rutted stream where the water just flows its way down off the main meadow and then disappears down a hole. 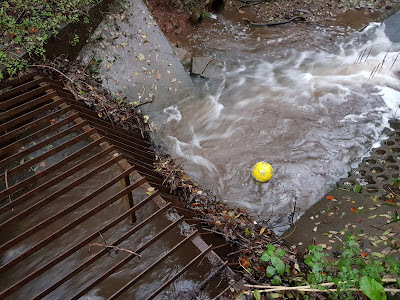 This looks cool, but I don't know if it is washing the bank away creating a potential hazard. Only time will tell. This little stream only came about as a result of LNR users walking along a desire line on the main meadow and the water will always take the easiest route. As a final word of caution, if you are visiting the LNR, bring your wellies (and a buoyancy aid). As a young(ish), naïve(ish) volunteer in the early days of The Friends of Henllys Local Nature Reserve, I started looking at tackling Himalayan balsam. Himalayan balsam 2009 (4 hours to clear) on the right in 2010 took 30 minutes to clear. Many parts of England and Wales have this invasive non-native plant, not just along riverbanks where they take over, but also in woodlands, meadows and pond margins. These become dominant and outcompete almost all native vegetation in these areas, resulting in a huge loss of biodiversity. I got into an interesting discussion with a couple of people who think this plant should be left alone and in 30 years it will die away leaving new opportunities for other plants. They also suggest that they are better suited to our changing climate. I strongly disagree with their ideas as a catastrophic loss of plant biodiversity would be lost in the process. From 2009, Himalayan balsam has encroached into every habitat on our Local Nature Reserve. All these habitats would be stripped of ground flora which would be replaced by a mono-culture. Mono-cultures are very risky things. go ask a forestry professional about the impacts of covering so much of the UK in larch in hindsight of the recent devastating disease. Resilience to change comes through diversity. You may get lucky by putting all your chips on Himalayan balsam on the Earth roulette, but I think it is better to spread the risk across almost all flora. There are some great efforts to try and tackle this plant across the UK, but unless a more holistic approach is taken, you will never get rid of this plant. Realistically, this means starting at the head of water courses and working your way down. The photo above, did not remove Himalayan balsam forever, we've been picking this patch each year since 2010. 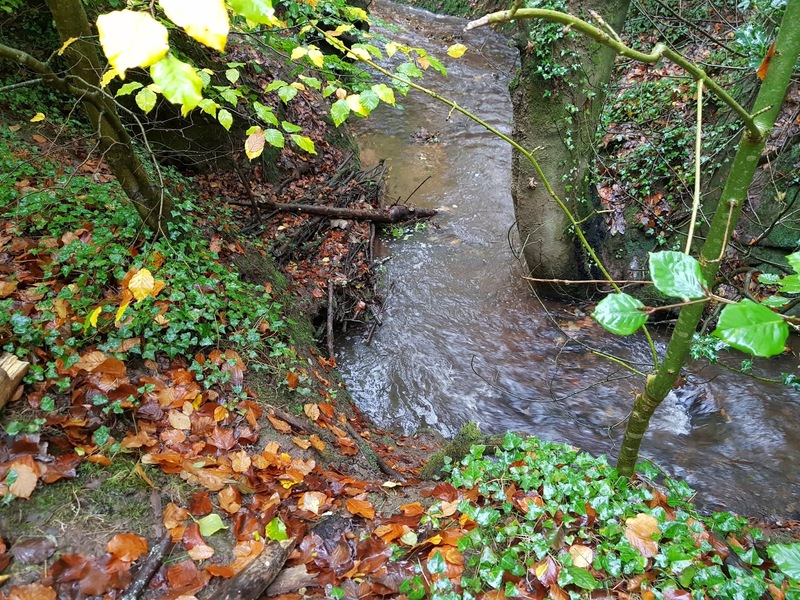 In recent years, we have been going upstream of the Nature Reserve and tackling it there. This needs to happen everywhere in a coordinated way if there is any chance of success and to avoid wasted efforts of the past. For a larger watercourse, say the Taff, this means starting in Brecon and systematically moving your way down, or getting an awful lot of people to tackle it in a coordinated fashion. Will that work alone as a one off event? No. Himalayan balsam germinates as early as April and last year I found some in November. This means going back over the same sites over a full season of growth. That leads to an important question of how many seasons would you need to do this for? In 2013, thanks to a Welsh Government-funded Tidy Towns project awarded to Torfaen County Borough Council on the back of our volunteering work, large new areas of Henllys Local Nature Reserve became accessible. On top of this we were also getting some of the other areas where Himalayan was already being treated more under control. In one new patch in 2014, we found an area which was completely dominated by Himalayan balsam. You couldn't see more than 30 cm into this area. We tackled this and removed all of the balsam. 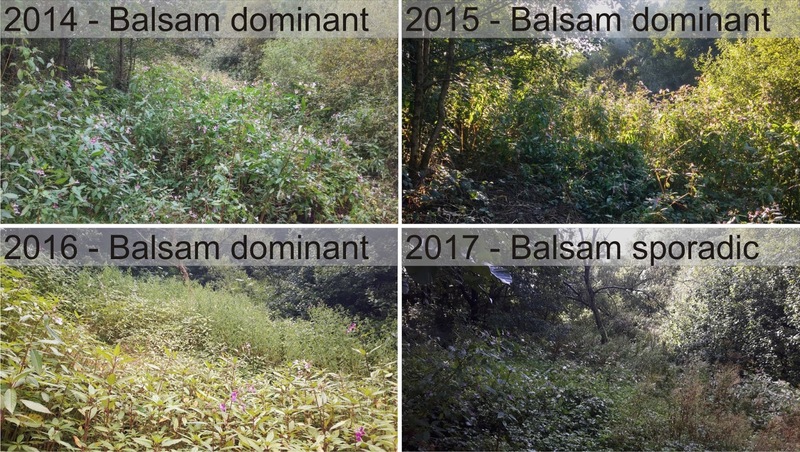 In both 2015 and 2016, there was no visible difference to the density and abundance of Himalayan balsam before we again removed all of it. In 2017, however, the density was hugely reduced. From this we think it takes 3 years to see a significant decrease in the seed bank. Seeds have a natural viability in the soil and after that they will rot. I imagine that work in this area needs to be followed up for the next 2 years. So 5 years of work altogether. So to do this on a larger scale would need an enormous resource of funding for 5 years to deliver. The table below shows the effort our group has put into (and adjacent to) the LNR to clear Himalayan balsam over the last 4 seasons. We still have around 10 hours to clear what is left on the LNR in 2017, but we tackled the same area which we did in 2016. This backs up what we have been seeing this year. If we started in 2009, how come we are still spending so much time on it in 2017? 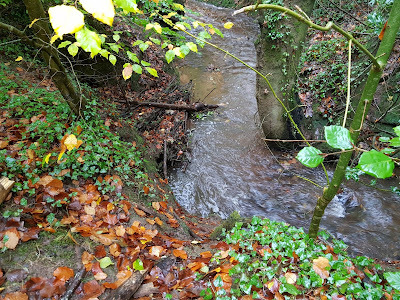 Early on, we didn't get to tackle the whole Local Nature Reserve and that was before we considered the possibility of seeding of our cleared areas from upstream. This will also be true of any other watercourse. I have seen tributary banks rammed full of Himalayan balsam, a Welsh Water sewage treatment plant in Cilfynydd totally overgrown with Himalayan balsam. I imagine lots of feeder streams are also in privately owned land and all of it needs to be sorted out in order to properly tackle this plant. The costs do to this properly would be enormous. I can see why many people put their head into the sand (or soil) and say they can't/wont deal with it, and by general inaction by authorities the situation is going to get much worse. For us, I'm very pleased we haven't had our head in the sand and continue to be so proactive and make those inroads. One thing is for sure, it'll be very interesting to revisit and comment on this article in 8 years time. The Physical Inactivity and Sedentary Behaviour Report was published on 3rd April 2017 from the British Heart Foundation and summarised on the BBC Website. 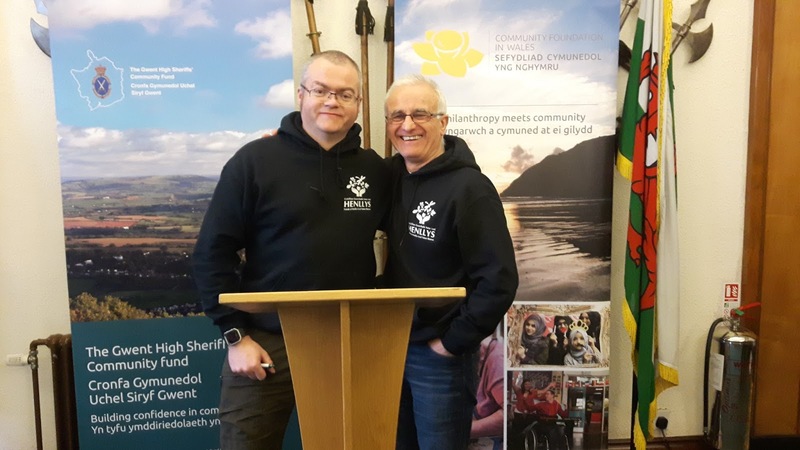 In it, it claims 1 million Welsh adults (42% of the adult population) are inactive and the estimated healthcare cost of this is over £1 billion. What can be done about this? 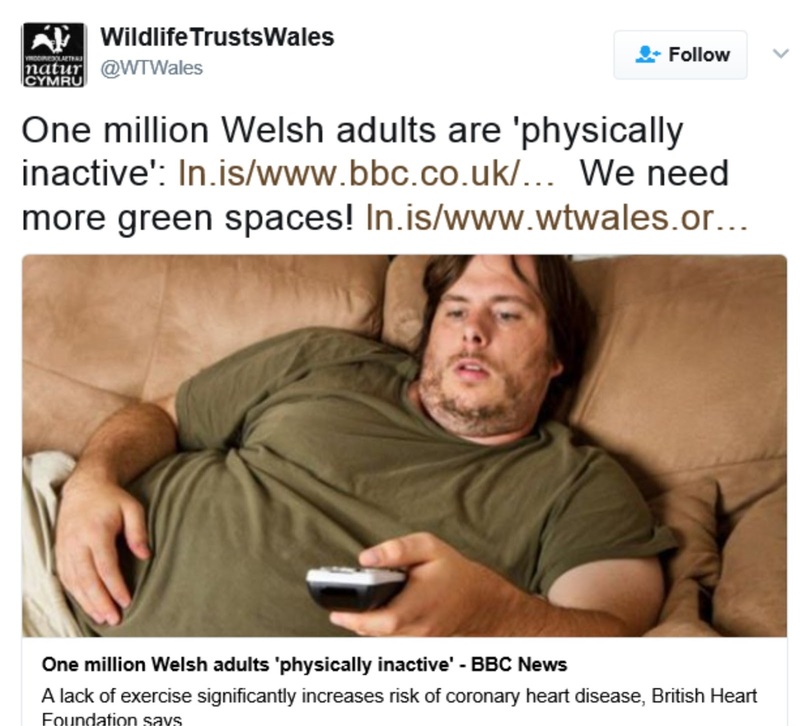 Wildlife Trust Wales have suggested, following the BHF report, that "We need more green spaces". I have to partially disagree with that as Wales is full of green spaces. Populations within the SE Wales Valleys are built around vast areas of green spaces. 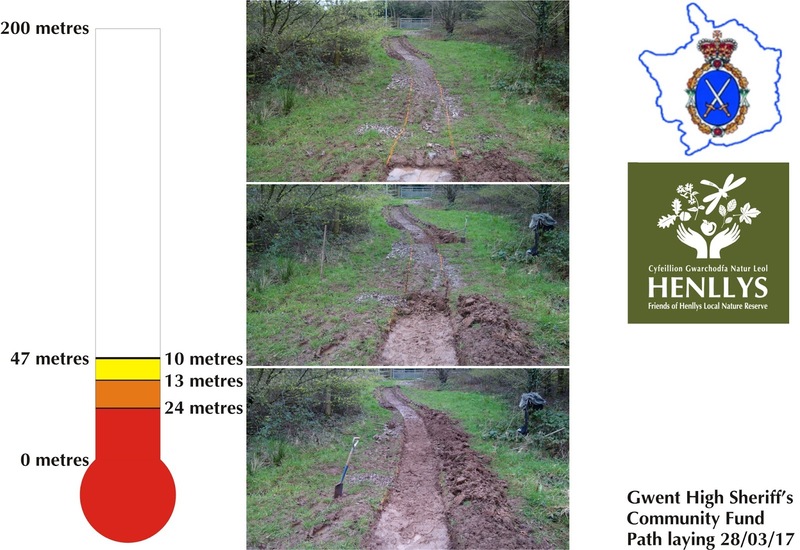 Moreover, Natural Resources Wales states that there are 20,750 miles of Rights of Way across Wales and 1/5th of Wales is open access land; that is plenty of green space. One problem is that many of our green spaces are under-funded, under-resourced, under-supported and all the problems which spiral along with that. Some lessons could be learned from the relative new kid on the block (Parkrun). Parkrun has been a revelation and has 10,000s of people running across the UK each Saturday morning. The group mentality of Parkrun brings people together in a shared experience and critically includes the couch to 5k scheme, which encourages and signposts people with lower fitness and confidence up to full Parkruns. We need green spaces with good access and signage to encourage people to use these spaces. To get to my local Gwent Wildlife Trust site at Henllys bog I need the same equipment I'd need if I was going up the Brecon Beacons in changeable weather. The paths are ill defined, often overgrown in summer and totally boggy for the other 360 days of the year. These issues aren't Wales' Local Authorities' fault. They have been suffering cutbacks for years and years and sadly often only responding to complaints from the public. 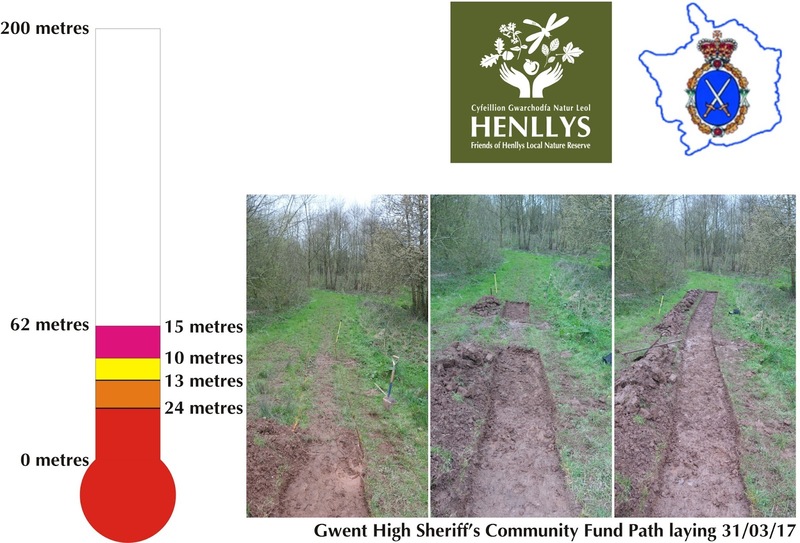 I'm not talking about improving access to every mile of footpath and bridleway across Wales, I'm suggesting focussing on those which are closer to areas where people live and there have been some good strides to do this in our borough, but it is largely grant-funded. The work we have just started here on the LNR with the Gwent High Sheriff's Community Fund path project is tackling just that. Nothing says your not welcome here like the access in the picture below on the left. Furthermore, you spend so long with the struggle, you forget to enjoy the benefits of why you came here in the first place and the your hall is full of mud and you're in trouble. This is not going to get people from couch to green space. The other angle we use which appears to encourage increased activity is to invite the local schools to come out and we deliver real functional practical outdoor activities. We've seen decreased anti-social behaviour and we've seen more adults walking on the LNR with children following these events. We've recently seen lots of small children showing off their cards at the entrance to the LNR, often with grandparents. Hopefully, they've also seen their snake's head fritillaries, snowdrops and primroses which they planted in October 2016 in flower this year. Getting children to take part in outdoor work not only gets them more interested in green spaces at a young age, but they also have more respect for their environment, more appreciation and more ownership. Best of all, they are also having fun. 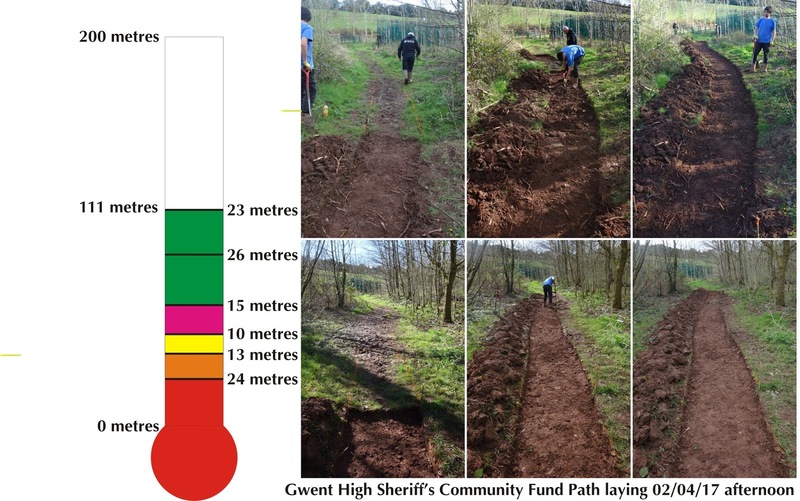 The final part to do is to support community groups and groups of volunteers to undertake practical improvements to green spaces (like we and many others do). There is less money for staff and less money for contractors, but with the right framework in place more volunteer groups can be supported. Volunteering makes a huge positive mentally and physically difference to an individual, they develop a Parkrun-like collectiveness and the wider public get improved green spaces. If you play this well Wales, there is a pool of around 1 million of them waiting to be tapped into and a health bill of over £1 billion and rising if you do nothing. 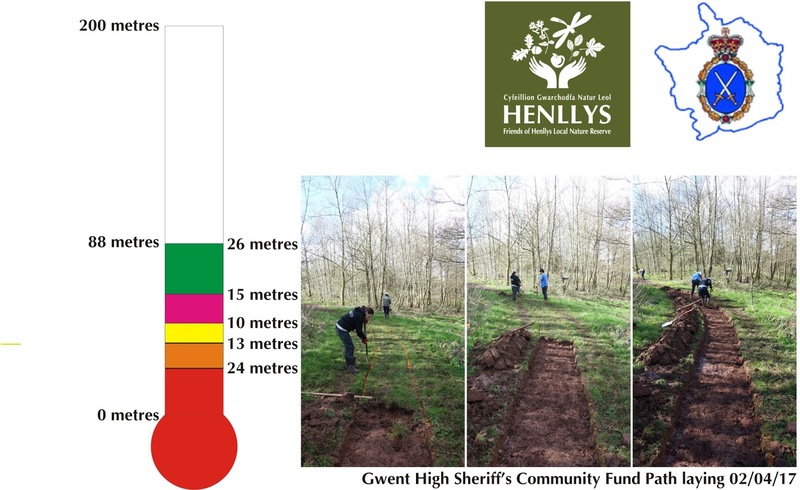 We were recently shortlisted from hundreds of applications for the Gwent High Sheriff' Community Award. 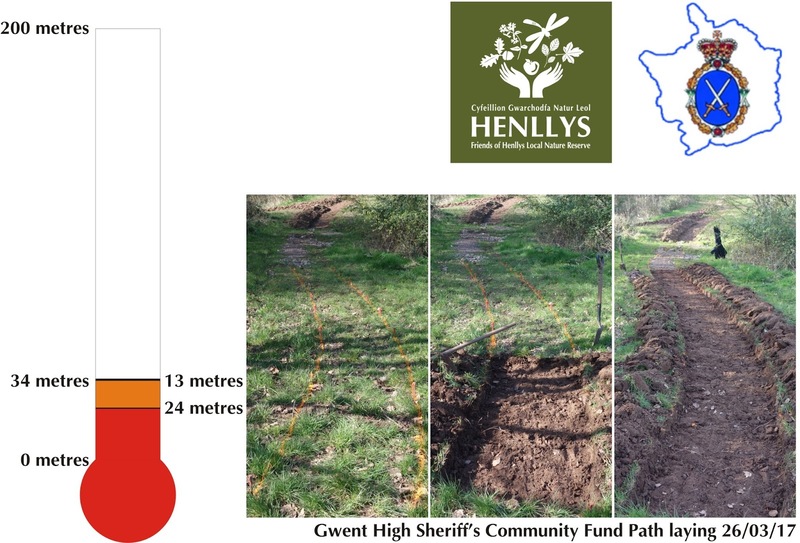 On Saturday morning, we had 2 minutes to convince the panel and largely the other applicants that we were deserving of £4000 to undertake some more work on the LNR. 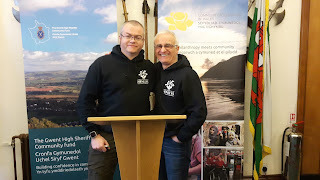 We had a meeting to discuss what we would do based upon feedback from the grant managers, Community Foundation in Wales (CFIW), who judged our project to be a lower priority with questionable links to the aims of the fund (It is good to have these checks). Luckily for us, this feedback allowed us to focus our presentation. When I read it out at 7am on the day, this was 4.5 minutes long, which we deemed would be frowned upon. So butchered it down to 2 minutes, if we made no errors. The nice thing about a 2 minute presentation is you can rehearse it a few times and change things very quickly. we practised at 9 am and by 9.05 am we were happy. We arrived at the venue early and found we were towards the end of the first half of the presentations, so had to be patient. The early presentations were very good and set the scene for the day. Those butterflies started up just before the group before us and we were gobsmacked by them. The group did a mini-performance of Les Miserables, which didn't help us much. However, we gathered our wits, checked our trouser flies, and flung ourselves into it like seasoned pro's and Brian even put a bit of Marlon Brando into his performance, like he promised. Anyway, we were delighted when they read out our names as being one of those chosen for funding. There was around £70k up for grabs and all the projects added up to £90k, so sadly quite a few groups did miss out. So firstly we'd like to thank Steve Williams, our ecologist from TCBC who approved our project in the first place and secondly to Cllrs. Thomas, Cross and Cameron who wrote letters of support which were needed in order for us to submit in the first place. 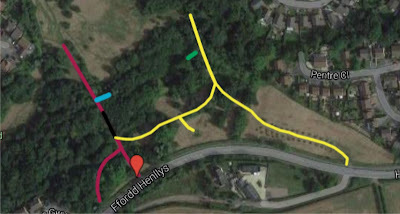 There are several parts to this work, the main part is creating 200 metres of path which join up all of the gates on the entrances on Henllys Way to the new path created in 2013. This will then continue down to the edge of the meadow mirroring the path on the orchard side of the main meadow. 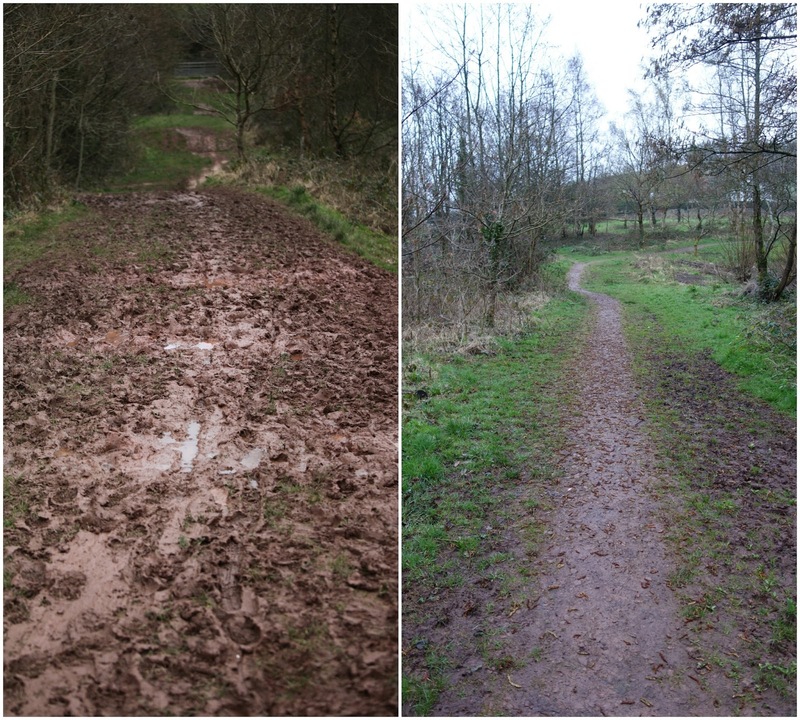 The big problem with the path on the left isn't just the difficulty of walking through the clayey mud, it is getting wider and wider as people naturally avoid the worst parts. This is increasing erosion and decreasing our areas margin vegetation. Moreover, alternative routes are being used now, which are creating new channelling points for water. Hopefully once the hard work has been completed, this would be a thing of the past. These hard paths aren't invasive to the LNR, but preserve it and improve access for all. 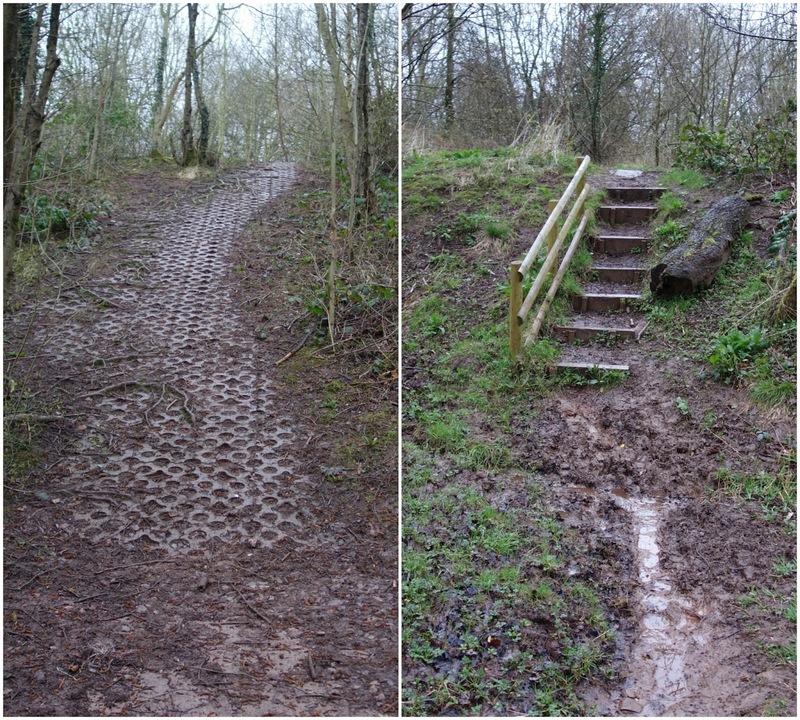 The next part is to construct steps down the grasscrete slope where we had to move the 25 tonnes of limestone recently (too many blog entries so just type "gabions" into the blog's search engine). This will be a very challenging and interesting project. There is also a very small boardwalk to be built at the bottom of the steps we built with TCBC Ranger Jon several years ago. One of the important things I've missed out is who is doing the work. There will be a mixture of our group and a call out for more volunteers, but the largest part will be done with local young people. Some of these will be from the upper echelons of the local primary school who love a bit of digging and shovelling. However, some will be with new contacts made recently with Cwmbran High School and Monmouthshire and Torfaen Youth Offenders. The main part of our presentation was about the affect that doing these works has on local young people and how they develop a sense of ownership and pride and this builds community support and decreases anti-social behaviour on the site. We used the analogy of a woodcrete bird box which was bought for us in 2013. It is lovely, well made, lasts for a very long time, but there is no ownership, interest or pride involved with this (only the birds like them). However, our handmade bird boxes which built and camouflage painted by local school children have an emotional investment which is invaluable, while the birds seem to like these ones too. We'll keep you posted with updates and events.